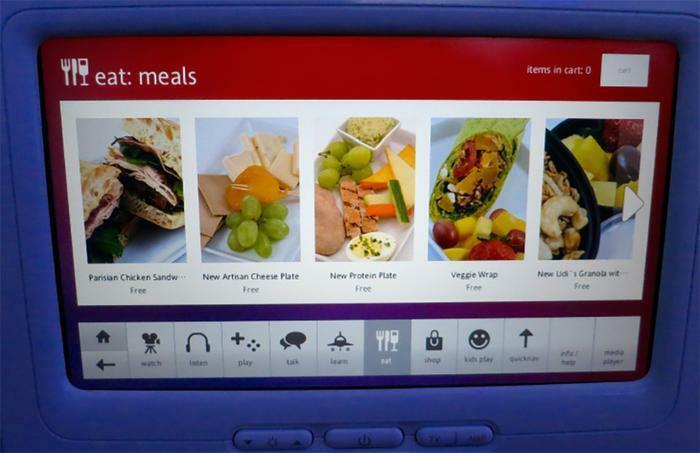 The words "airline food" are usually good for a laugh, but at New York's Hunter College, researchers take the subject seriously. They've just completed the latest annual study rating the food choices at 12 airlines. The winner was Virgin America, followed by Delta and Air Canada, which tied for second. Frontier was dead last, with the researchers recommending you bring your own food. The study is directed by Charles Platkin, PhD, JD, MPH, the executive director of the NYC Food Policy Center at Hunter College and editor of DietDetective.com. The study assigned a "Health Score" (5 stars = highest rate, 0 stars = lowest) based on ten criteria, including health and calorie levels of meals, snack boxes and individual snacks, improvement and maintenance of healthy offerings, menu innovation, and cooperation in providing nutritional information. Best Bets: Avoid the individual snack if you can. Even the nuts, which are the best choice, are high in calories if you consume the entire package. Always choose a real meal if you can, even if it's slightly more calories it will keep you full longer. For breakfast, try the Udi's Granola with Yogurt and Fruit, which is a bit high in sugar but overall low in calories at 330. The best snack box is the Protein Meal with hummus, nuts, and tuna; the others are a bit high in calories and are not really worth it. Best Bets: For a snack, the nuts are the best choice -- even over the lower-calorie pretzels. The vegan, gmo-free Tapas Snack Box is a good healthy choice if you share or make it a meal (it's too high in calories as a snack). Best Bets: For breakfast, the Greek yogurt is still a good option and will probably fill you up. And while the egg sandwich has bacon, it's low in calories and has slightly more protein than the yogurt. The Chicken Soup is a low calorie choice for a snack that will fill you up, but be wary of the 950mg of sodium if you have high blood pressure. The Celery & Carrots with Ranch Dip (if you use no more than half the dip) is still an OK choice. The peanuts are the best, even though the pretzels are lower in calories. There haven't been many healthy changes to the menu, and don't be fooled by the word "veggie" in the wheat thins. Best Bets: Perhaps the trail mix -- but we had to estimate the calories and don't know the nutrient values - share it and you'll be safe. Also, if you're not sodium sensitive you can grab the jerky. Bring your own food is the bottom line.